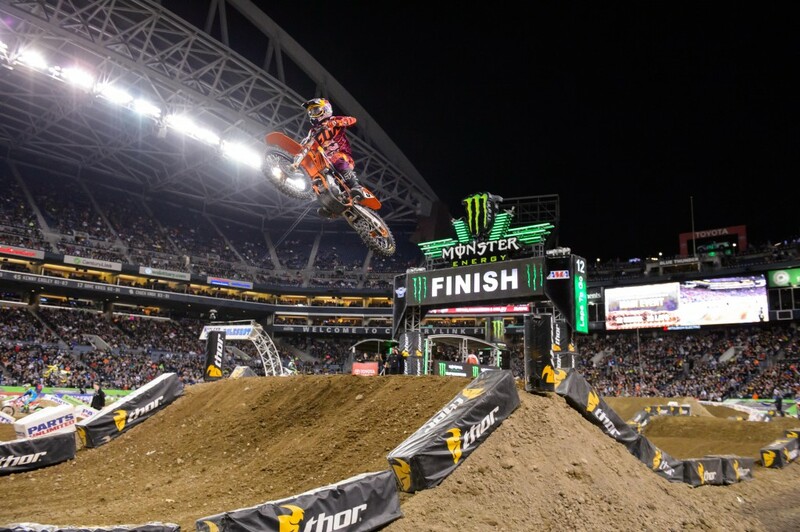 Supercross is the most-watched motorcycle racing series outside of MotoGP with statistics of more than 800,000 spectators per season and a TV footprint reaching almost 200 countries through 100 broadcasting hours; startling numbers considering the championship does not leave the shores of North America. In the USA it is the second most-watched motorsport. Phoenix was a small milestone among the extensive list of racing accomplishments for the factory and one that was overdue. Why was triumph in the arenas of the USA a significant feather in the cap? To answer this it is worth looking momentarily in another direction. KTM entered Grand Prix road racing at the beginning of the century and toasted numerous victories in 125 and 250cc categories. They buried the programme through the lean years of the financial crisis but then emphatically re-entered MotoGP with Moto3 in 2012. Expansion to the Red Bull Rookies series followed and a step into the premier class is yet to come. Why do KTM road race? Simple: the international exposure of MotoGP is enormous and has brand repercussions for any motorcycling manufacturer, particularly if they focus on sport machinery and have a slogan like ‘READY TO RACE’. If MotoGP is an opportunity too good to miss (and required large, dedicated resources of R&D and finance) then Supercross was – and is – in the same bracket. Motocross in the USA had already been conquered. Grant Langston made sure of that in the early noughties and although success was sparse in the remainder of the decade KTM were already established. 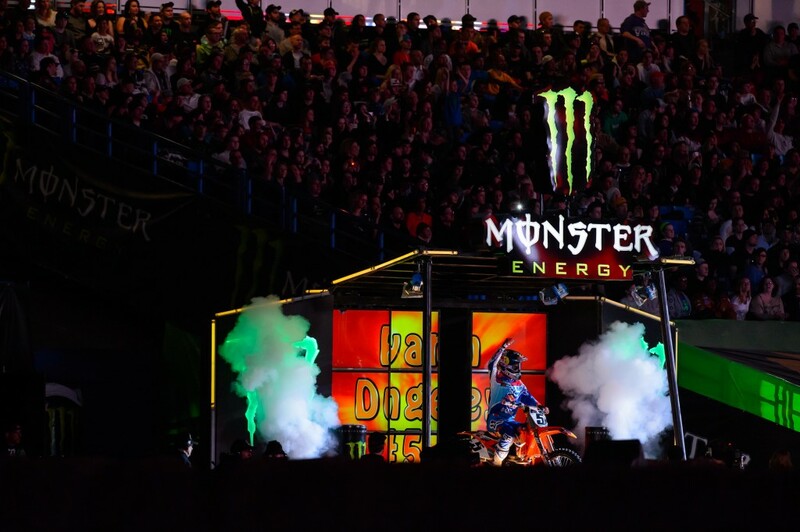 ‘Indoors’ was a different prospect and glory through the triples, doubles and whoops and under the lights could have positive repercussions and other roll-off consequences, such as resurrection of the popular KTM Junior Supercross Challenge. Visit any one of the seventeen annual AMA Supercross events and you will see why it is the biggest platform for any motorcycle with knobbly tyres. The Baseball and NFL stadia used to mount the narrow and devilish courses provide walls of fans, comfort, convenience and a perfectly accessible ‘stage’ for racing: thus promotion, thus sales. The sounds, lights, buzz, noise, gleam (largely clean dirt bikes!) and fireworks all part of a very tangible show. The rounds have their own flavour; the expanses of Daytona markedly different to the tightness of San Diego, the crowd of New Jersey varying from those dedicated staple races in California. The skill of Supercross, the scary accidents and the sheer pace in the way the athletes tackle the many obstacles mean that this is not ‘motocross-lite’. 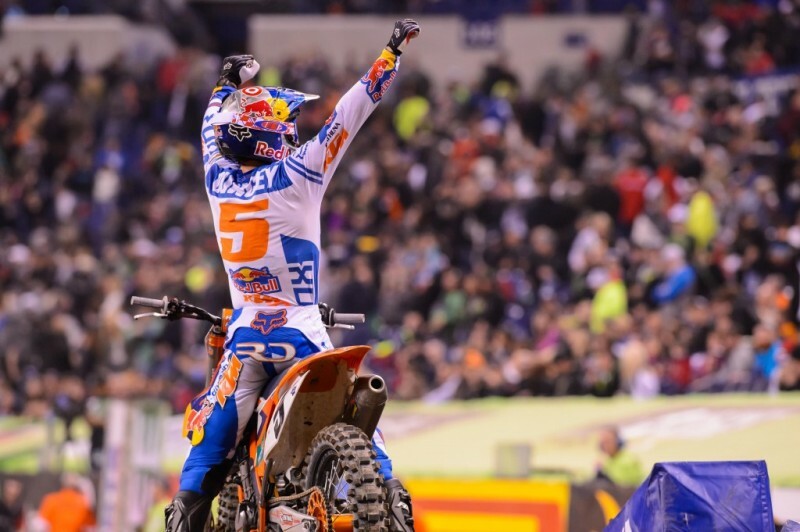 Dungey owned Phoenix in 2012 which was his third major race on the KTM 450 SX-F and it was part one of the tipping point by Austria and KTM North America towards a serious attempt to cast the brand as major players in this hefty (live televised) production. The influence, experience, knowledge, hands-on role and stewardship of Roger De Coster has been cited many times as one of the reasons why KTM have risen to the top in SX. The Belgian has played an integral role but there is no doubting the vision – that was initially pitched and sold to CEO Stefan Pierer to get the ball of investment rolling in place – by others in Austria and Murrieta and the likes of Pit Beirer, Robert Jonas and Jon-Erik Burleson. KTM HQ in California would initially house what would become a powerhouse of a racing team (with carefully placed foreign imports like Marvin Musquin and Ken Roczen) and then expand to evolve the latest pre-production wares and ideas from Mattighofen to become a subsidiary with a potent advantage. Racing would blossom further with engine services extended to the Rockstar Energy Team and for 2015 to the Troy Lee Designs squad among others. Has it worked? The numbers would indicate so. KTM were always rallying against the swan dive of the industry with new and enticing motorcycles but there has to be more than this to explain the vast 28.8% upturn in 2013. In the first half of 2014 more than 10,000 ‘vehicles’ were sold, virtually 25% more than the previous year and during a period when KTM increased their market share in America by almost 16% (to 4.4%). The USA was responsible for almost 20% of KTM’s revenue in this six-month period. Headlines in the specialist press were running along the lines of KTM being the ‘fastest growing manufacturer in the USA’, and this in a sector that had halved in volume and is now increasing ever so slowly compared to the boom years of the middle of the last decade when over a million bikes were shifted. Hopefully the bubble is steadily growing for KTM in the States not only with their competitive portfolio (if Dungey takes the championship then the Austrians will have won every major offroad racing category in existence) but also their bottom line. The profile for the Street market has been able to depend on collaboration with the HMC team and riders like Chris Fillmore who have given a competitive window to the RC8 in AMA Superbike since 2011. Although the national American series has had its share of (well documented) problems the initiative by MotoAmerica to resurrect the flagship domestic road racing competition this year has given cause for optimism. With KTM now looking at MotoGP participation within the next two years and whether this means a reworked RC8 in the future or a brand new sportsbike (or expansion of the RC Cup Racing series to the U.S.) remains to be seen as the ‘smooth tyre’ division of the racing operation faces some interesting possibilities ahead. Away from a chequered flag exposure through the likes of Stunt rider Aaron Colton and the large Red Bull window (something in place with the young Minnesotan since 2013) is another asset for North America’s Street programme. 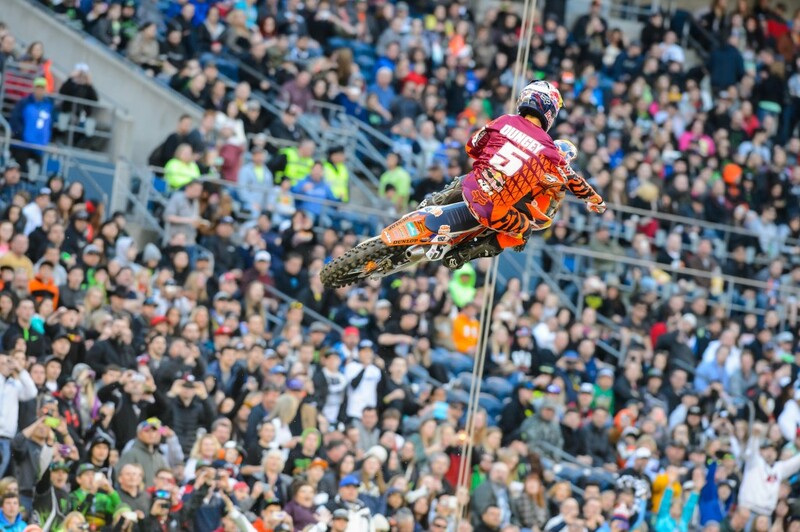 Supercross was always a sport that could not be ignored by KTM. The difference now is that they have discovered the formula (riders, support from Austria, key leader and resources) to really exploit its potential in the last three years. 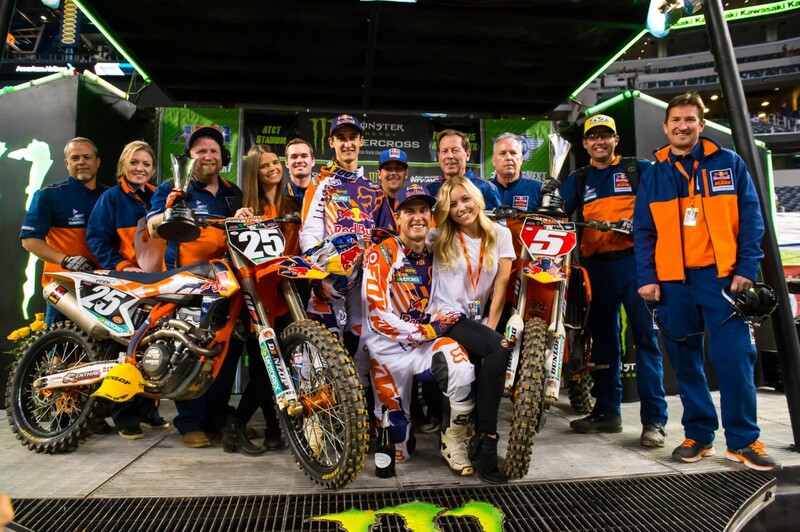 For racing fans – all racing fans – it is undoubtedly uplifting to see that presence and success on the track carries worthwhile benefit, because it signifies that companies like KTM will carry on investing and competing. It means that racing does not become an expensive project excused and justified solely by ‘development’ or ‘tradition’ or by being part of a manufacturer’s forced policy. For that everyone becomes a winner. Great Team and great people. I love the Factory KTM team. RD5 and Marvin are great representatives, not to mention Hill. Roger Decoster is of course the man! If the WP suspension wasn’t so bad KTM would have a lot bigger market share. I ride orange.